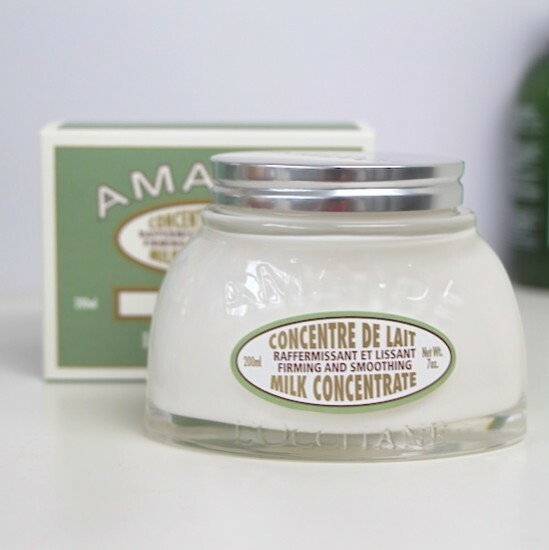 Quite possibly my most favourite body cream of all time, I have thought up a new category for l’Occitane’s Amande Concentre de Lait: Thing of Beauty. I shall reserve this category only for things that I love totally and utterly, without reservation and ignoring little details such as…er…price. It just so happens that this unctuous, heavy-jarred body cream isn’t too ridiculously priced, so it’s a good one to kick off with, isn’t it? Just look at that packaging! The Farrow & Ball colours on the box, the decorative, stoutly-shaped jar…it’s like something you’d bring home from a French market with your bunch of lavender and your eggs and your cheese wrapped in chequered cloth! I still have the cardboard boxes from my last two jars of this stuff because I can’t bear to throw them out. I have the empty jars, too, which is quite sad, I suppose. I keep meaning to fill them up with something but can’t think what – they’re not quite the same once the white, creamy product has disappeared from inside! About that creamy product: it’s so insanely good. Obviously if you hate gourmand-y scents then this one might not be quite what you’re looking for, but I would point out that it’s a soft, natural smell and not at all overwhelming. It’s just very comforting and slightly sweet – like the beauty equivalent of nursery food. In terms of texture, it’s rich and silky in feel but light and easy to apply. There’s no greasy residue so you can use it almost immediately before dressing and it’s fresh enough to use as an aftersun, should you need to. The Firming and Smoothing claim? Je ne “give a crap” pas! Perhaps it does firm and smooth, perhaps it doesn’t – I don’t even dwell on it. It’s just bloody lovely as it is, no need to say more. L’Occitane’s Milk Concentrate is £35 with free delivery from FeelUnique here. Next Post Everyday Cream Shadow for Lifted Lids!